Old documents must be viewed with love and at length, then perhaps they will reveal something. 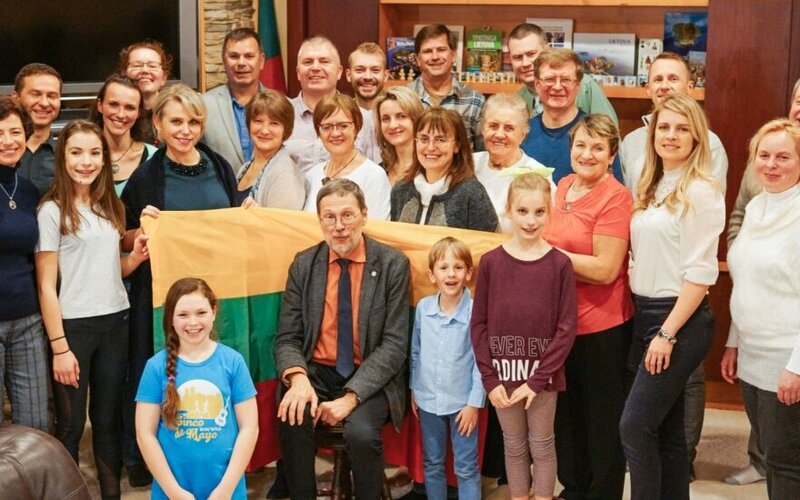 At the moment I found this historical document in Germany, the first thought to cross my mind was how I will have to continue living," VDU professor Liudas Mažylis told local Lithuanians in Portland after having been invited by Lithuanian Consul General Darius Gaidys. Most likely, many of us, common mortals, who accomplish such a dream, would put a full stop in this story, but not L. Mažylis. I just received his futuristic novel 99 Metai po Įvykio (99 years after the event) which I ordered from the Pegasas bookstore and somehow I do not believe that it is the author's last book on history. Unless this is obstructed by the search for the Latvian Republic Act of Independence... which our brothers, to my memory, have not yet found, with the exact date of their centenary (November 18 this year) nearing ever closer! The especially warm West coast winter this year served to help us celebrate the centenary of the Homeland already in January with another famous historian – dr. Norbertas Černiauskas and the authors of the project LT Identity Jolanta Rimkutė and Ieva Ševiakovaitė. Both famous historians, N. Černiauskas and L. Mažylis, had so far only briefly met in the Lithuanian cabinet building in Vilnius, while this time they could interact unobstructed, drinking the world famous local Portland brewed beer. Meanwhile with the aid of the Lithuanian Community Culture Council, the founders of LT Identity and dr. Norbertas visited both Lithuanian schools in the state of New Jersey, after which they crossed the United States toward Seattle and Portland, ending their patriotic journey at Chicago, which is held to be the US Lithuanian "capital". 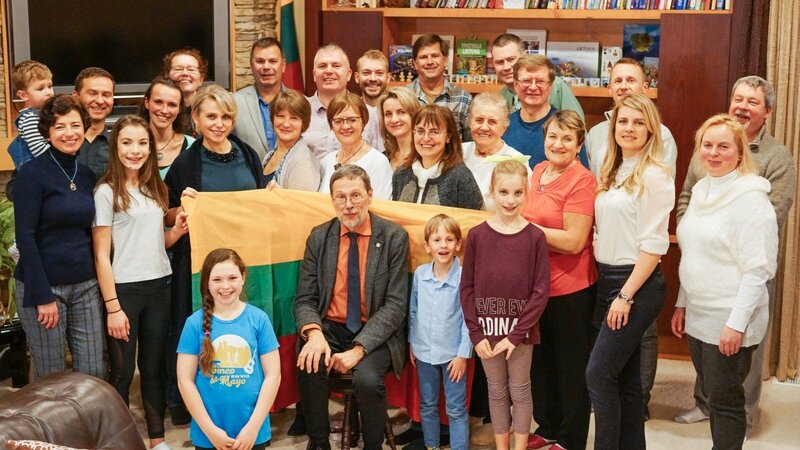 Meanwhile the celebration of the Lithuanian independence centenary continues at full speed across the Atlantic. Last Friday, on February 16, we travelled to Los Angeles, visited the crypt of signatory Mykolas Biržiška at the Kalvarijos cemetery and spoke with his granddaughter Danutė Barauskaitė-Mažeikienė. Then we participated in the grandiose event at the historical Los Angeles Biltmore Millennium hotel, which was excellently organised by the Lithuanian consulate with the aid of the local Lithuanian Community district. Meanwhile in the nearby Staples arena, the NBA All Star Weekend was held, during which Domantas Sabonis, who represents the Indiana Pacers had a memorable performance. While Consul General Darius Gaidys recounted the past 100 years of Lithuanian history to the 400 guests gathered at a hall of the most luxurious Los Angeles hotel Crystal, Domas led the World Team to a deserved victory against the US Rising Stars. Earning 13 points and grabbing 11 rebounds in 18 minutes, the Lithuanian national team's centre ensured the foreign first and second year NBA players' victory against the best American prospects of the strongest basketball league in the world with a score of 155-124. Dedicating the excellent performance to the centenary of Lithuanian independence, D. Sabonis received an opportunity to remember his Homeland once more prior to departing the City of Angels – for 24 hours, the Los Angeles airport's pillars were lit in the colours of the Lithuanian tricolour in honour of the land on the Nemunas'river. Meanwhile our roads took us to Seattle on the next day, where we marked the centenary of Lithuanian independence together with our fellow compatriots living in the area. The celebration of the centenary is not ending yet – this weekend all Lithuanian North West roads go to Portland... This coming Saturday we await an excellent celebration together with the folk music band Biru Bar from Indiana, who have not yet played in the states of Oregon and Washington.